The Best Selling Commercial Grills for Over 57 Years. Two (2) 30,000 BTU, low pressure cast-aluminum burners are excellent for simmering and sautéing as well as steaming. This UL approved low output, low pressure system arrives equipped with a regulator and 3 ft. hose and weighs 36 lbs. making it ideal for transporting from one event to another. The sturdy, durable powder-coated frame with 3-sided windshield gives you the option to operate the unit on a table-top (14” tall) or have it free standing using the included leg extensions (32” tall). 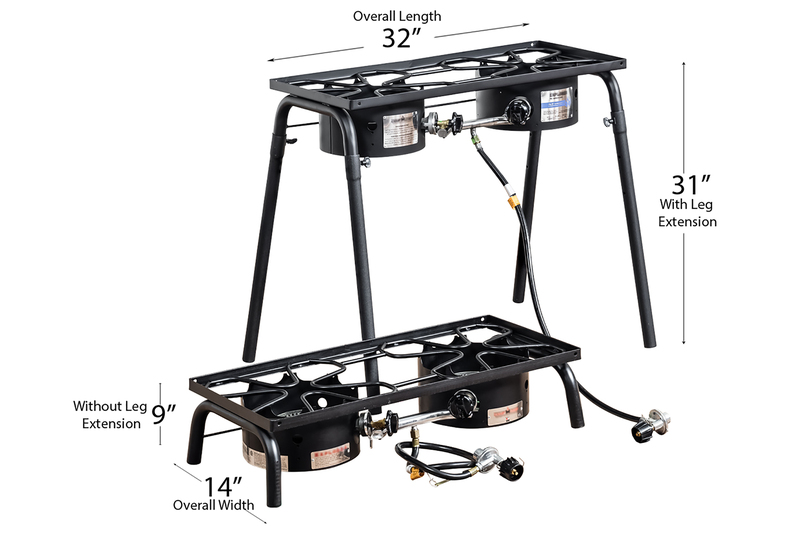 With a 14” x 32” cooking surface, the heat from each burner is evenly distributed over the bottom of the pot for efficient heat retention and recovery. • Total weight of EX60LW is 36 lbs. • Shipping weight is 36 lbs. • Ships via UPS Small Package. Need it fast? Select “I need Expedited Shipping” at checkout.